Phnom Penh (FN), Feb. 18 – Cambodian Minister of Foreign Affairs Prak Sokhonn expressed the deepest condolences to Indian Minister of External Affairs H.E Sushma Swaraj on the loss of many security officers in a suicide bomb attack in Pulwama, Jammu, and Kashmir on 14 February 2019, according to the ministry of foreign affairs letter dated Monday. 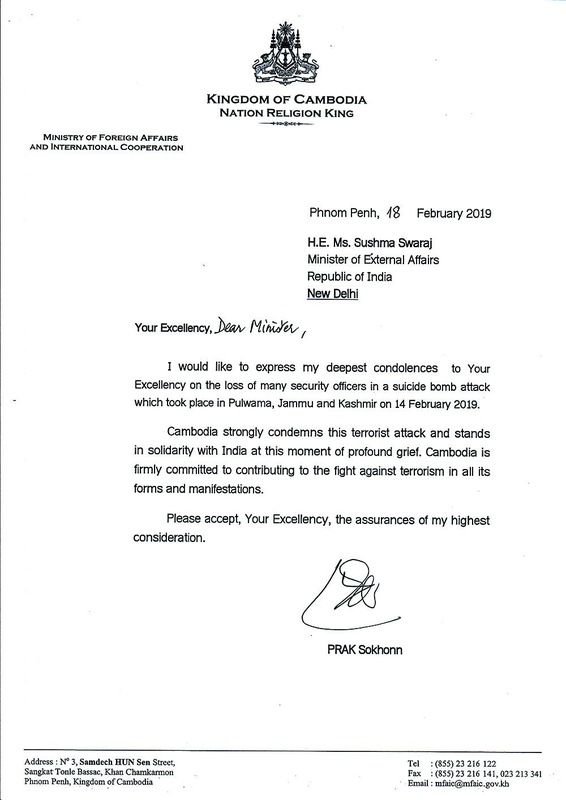 “Cambodia strongly condemns this terrorist attack and stands in solidarity with India at this moment of profound grief,” the ministry wrote in the letter. “Cambodia is firmly committed to contributing to fight against terrorism in all its forms and manifestations,” the letter added.